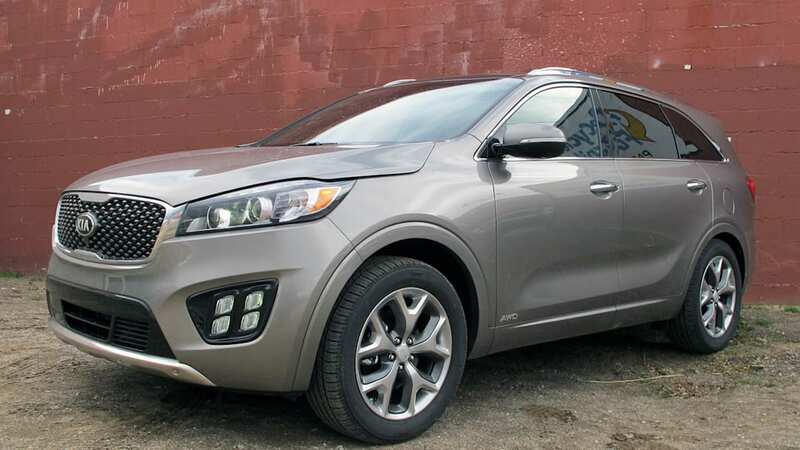 Autoblog rating for the Kia Sorento is not available. Please check back later. Teenagers are awkward, predictably provocative and generally horrible to be around – at least unless you, yourself are one. There's just something about those angst-ridden years spent trying on identities, none fitting quite right. 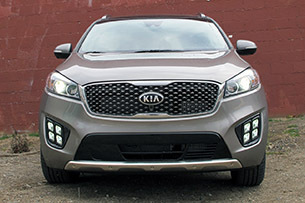 Luckily for Kia, the automaker has just celebrated its 20th birthday in America, and fresh out of the driver's seat of its 2016 Sorento – dare we say it – we sense a touch of self-assured maturity. Don't worry; we expect the automaker's antics – including super-freak athletes jumping over an Optima at the NBA All-Star game and the employment of urban hamsters – to continue. Thankfully, offering unremarkable vehicles in pretty competitive segments seems officially a thing of Kia's history e-book. To be fair, we've seen a pleasing Korean Renaissance for a few years now, and we're not just talking hot pots and bulgogi – 2015 Hyundai Genesis, anyone? 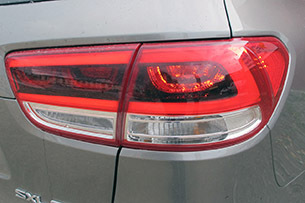 Kia Optima SX? Soul? 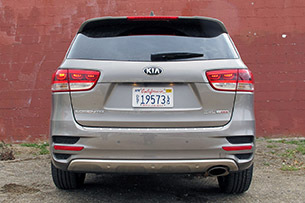 So where exactly does this third-gen 2016 Sorento fit in? 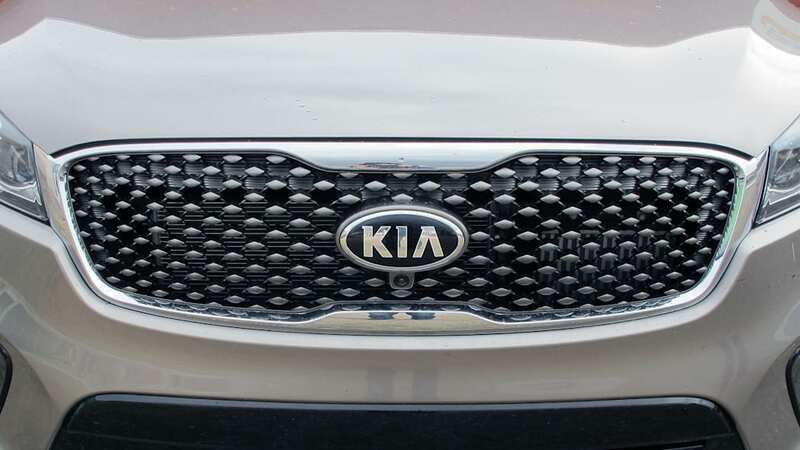 Actually, we're not sure Kia knows that either; its product planners tell us that this miraculous crossover competes with variously sized vehicles including the compact Jeep Cherokee, markedly larger Grand Cherokee, and even the family-hauling three-row Toyota Highlander. 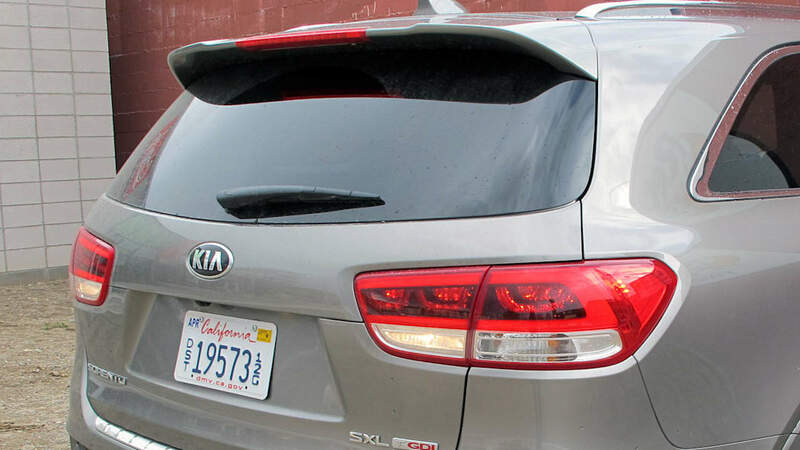 But Kia is also not completely off its rocker, because the Sorento suffers (benefits?) from severe bipolar disorder in terms of pricing. 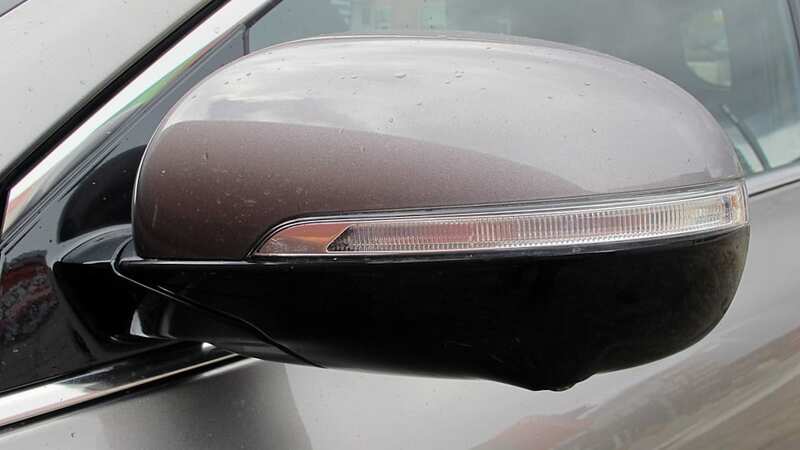 While you can get a base L model for $25,795 after delivery – there are five trim levels including L, LX, EX, SX, and top-of-the-line SXL – the fancy SXL 2.0T with all-wheel drive we tested was priced at $45,305. That's a difference of almost $20k, with the latter model reaches a completely different, almost premium demographic. And there's more. 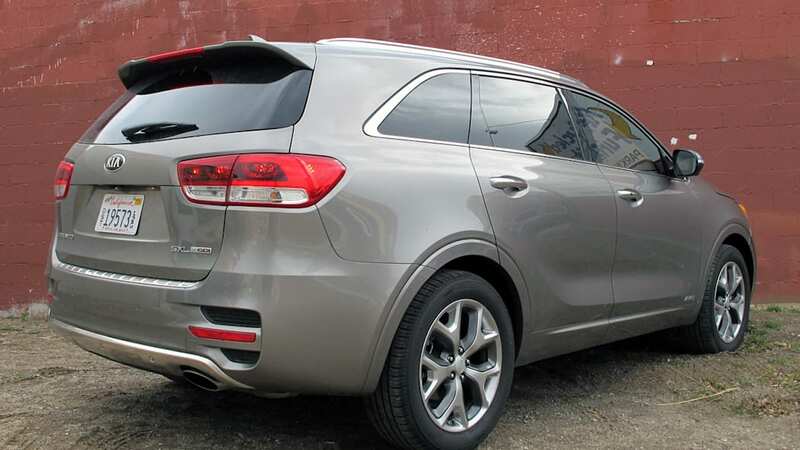 Sometimes the Sorento seats five, other times it can party hard with seven. 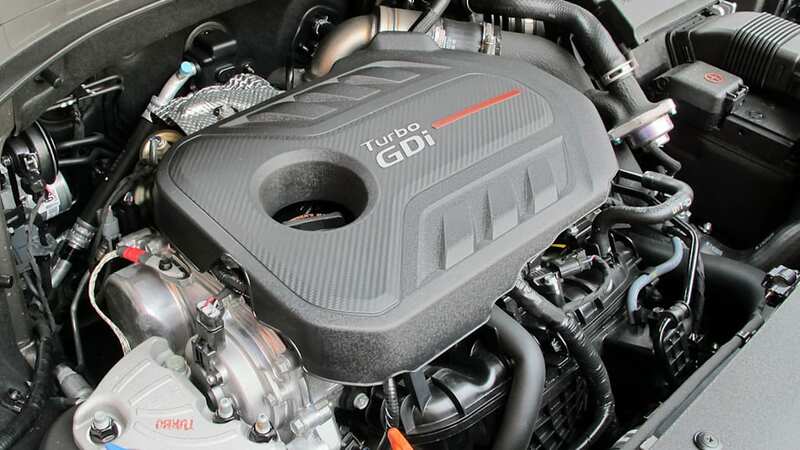 There are three very different engine flavors to choose from: a carryover 2.4-liter four-cylinder will greet entry-level buyers with 185 horsepower and 178 pound-feet of torque. A meatier V6 – good for 290 hp and 252 lb-ft – will come on three-row models only, while the new 2.0-liter turbocharged four option, good for 240 horses and 260 lb-ft comes on two-row models exclusively. 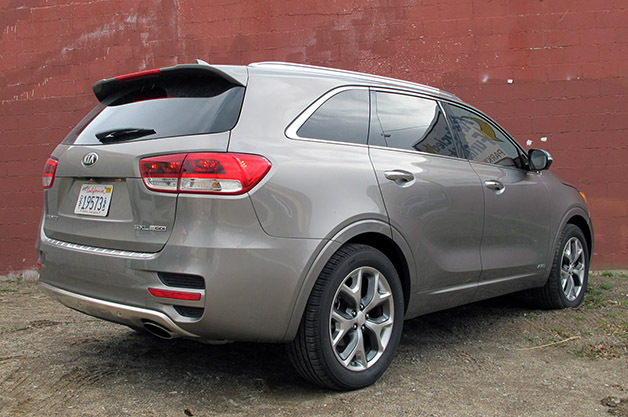 Kia will offer all-wheel drive on all Sorento models. 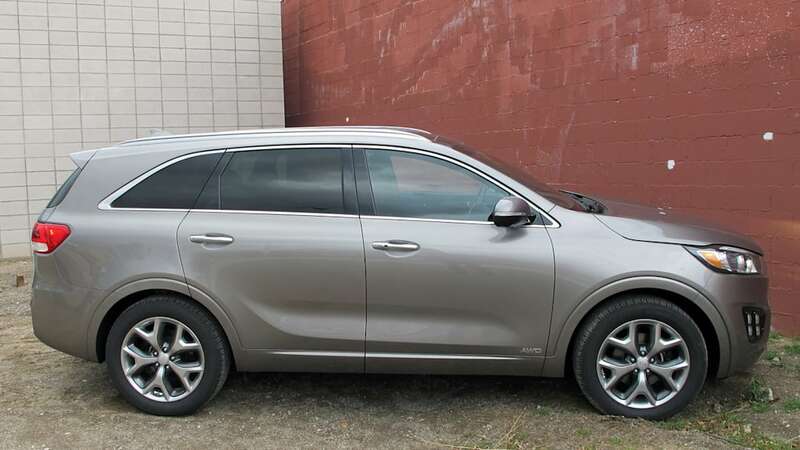 When we spoke with Steve Hirashiki, Kia's head Sorento product planner, he told us the turbocharged engine is a little sportier, a good fit for a five seater, while larger families and those with towing needs will appreciate three rows and a heartier engine. 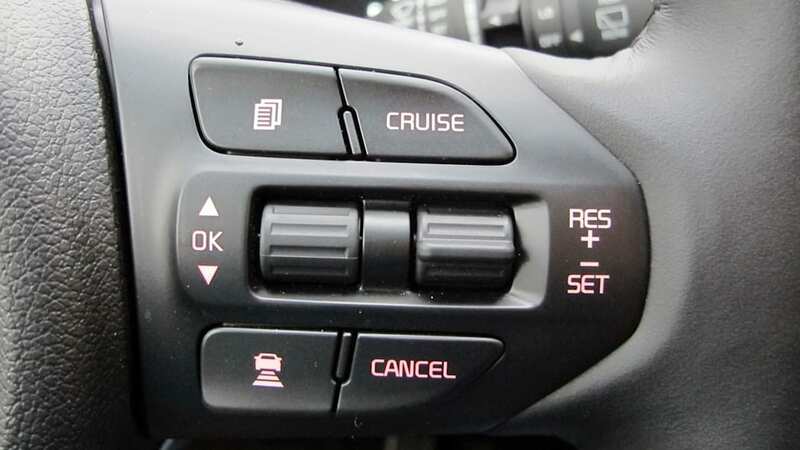 Regardless of which engine you prefer, it'll be mated exclusively to the six-speed automatic transmission that was available on the last-generation Sorento, though we're told more cogs are in the works – possibly to match the Cherokee's nine-speed unit. 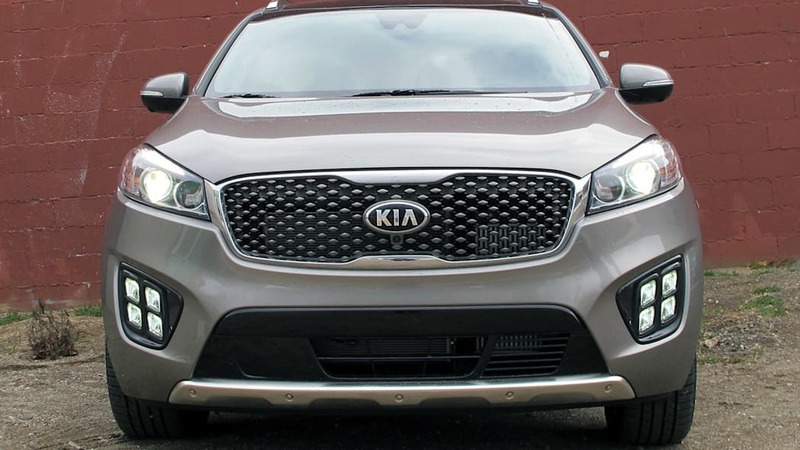 In response to the harsh Northeast winters of the past couple years, Kia says it will offer all-wheel drive on all Sorento models; The DynaMax-branded system will run an additional $1,800. Fortunately, with the most severe storm California has seen in a half-decade greeting us on the day of our Lake Tahoe drive, our models had power delivered to all four wheels. In fact, a heavy dose of wet snow greeted us as we raced over to the first model we'd test, and quickly we were out of the soggy cold, and into the firm, supportive and well-bolstered dark gray leather seats. 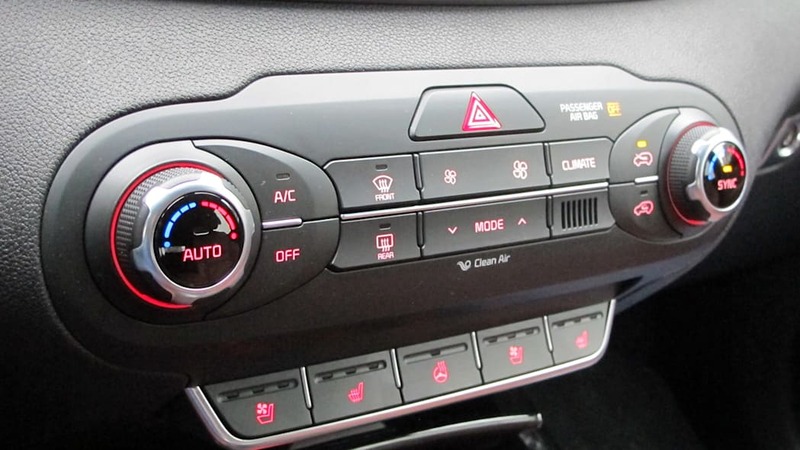 Kia has optional 14-way power adjustment for the driver, and eight-way for the passenger. 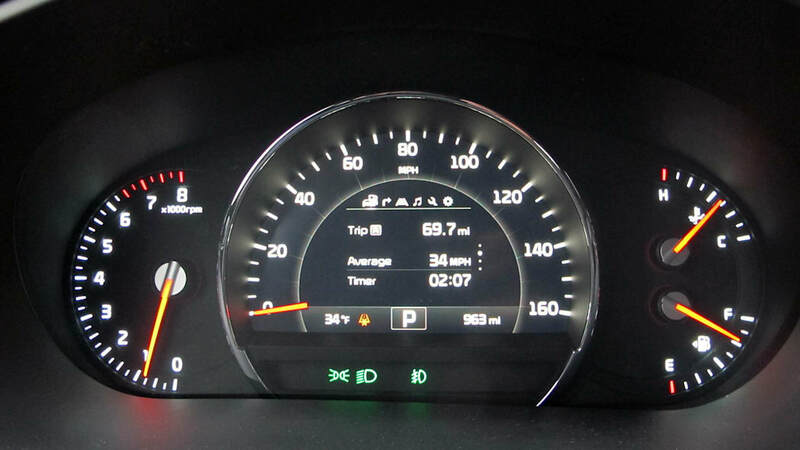 Immediately noticeable was the new instrument cluster: its heart is digital, attractive and features red needles over white numerals. 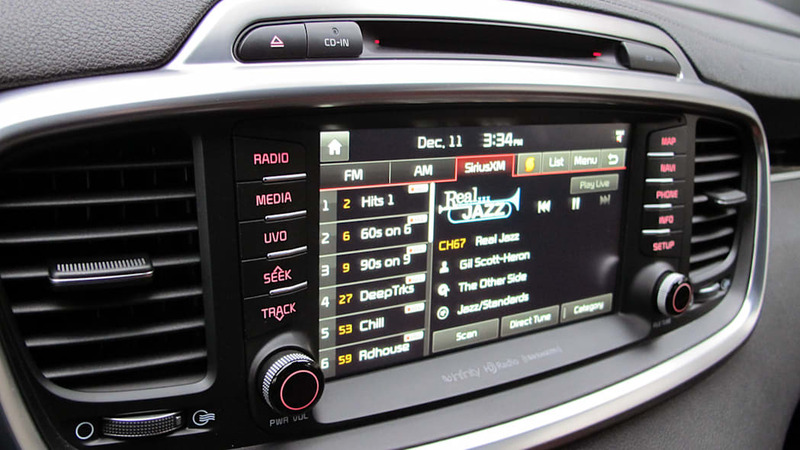 The optional eight-inch UVO color touchscreen looks modern, flanked by buttons for the audio system, media and navigation system, and features proper knobs on either side for volume and to scroll through the menus. There is a nice, harmonious and premium-looking cabin to be had if you select the right trim. 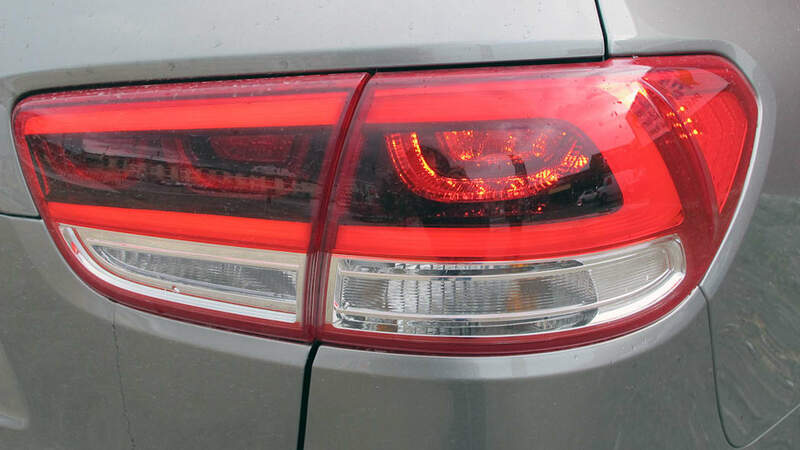 At a glance, the center stack looks like a hybrid offering from Jeep and Volkswagen. 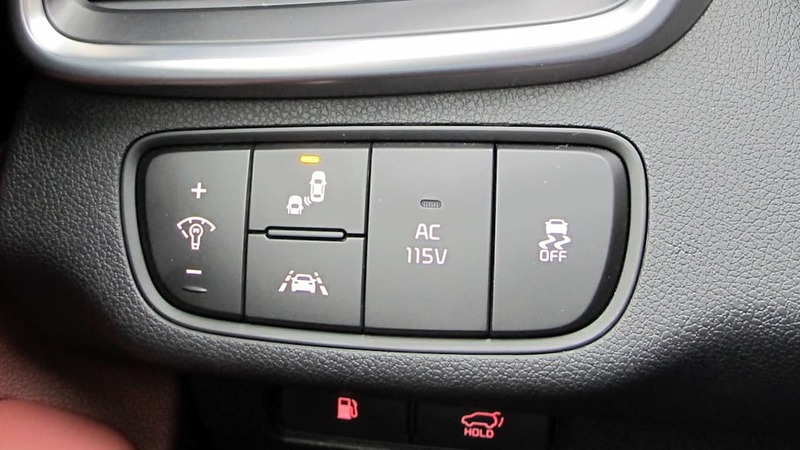 Under the touchscreen are climate controls with individual knobs for the driver and passenger, and below that are two buttons for heated seats, and three blank do-nothing buttons for what would be the ventilated front seats – the Sorento has optional heated and cooled seats up front, with heat for rear passengers as an additional option. 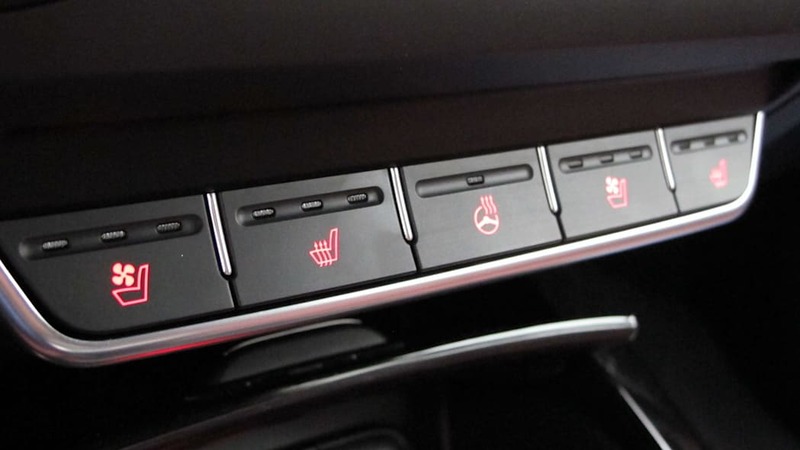 We also noted a blank button presumably for a heated steering wheel, something our pansy-California fingers appreciate on even mild mornings. 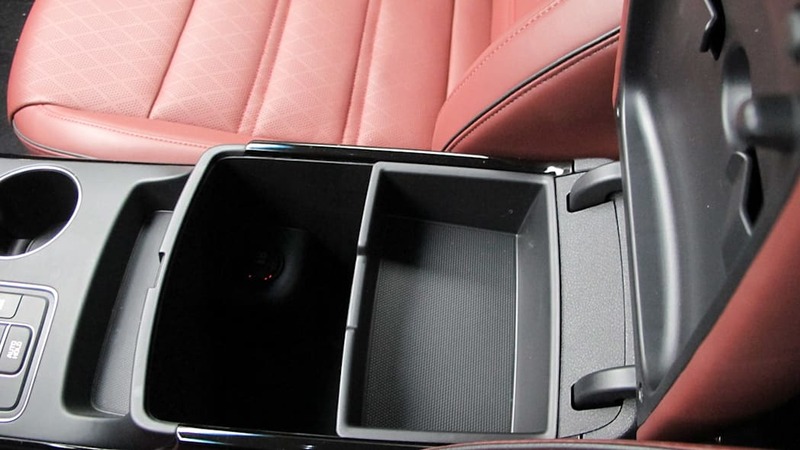 Further down is a handy storage cubby with USB and power plugs. 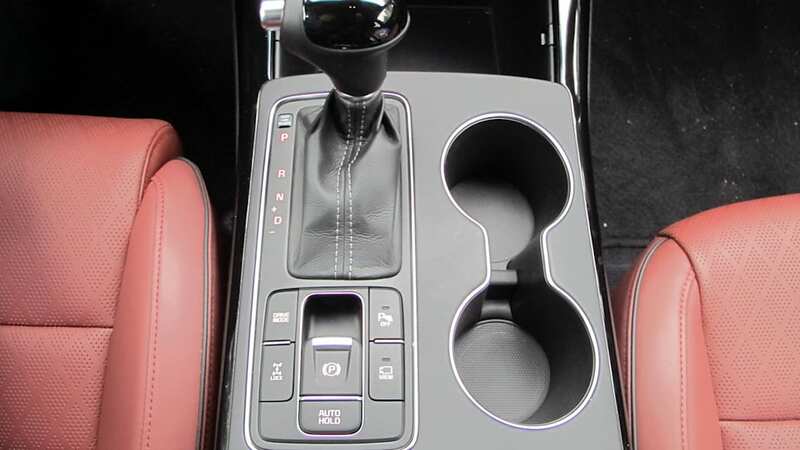 Near the shifter and the chrome-ringed cupholders are three additional buttons: one for the three selectable drive modes – Normal, Sport, and Eco, all of which adjust steering and shift points only – as well as buttons for the parking radar and lock mode. 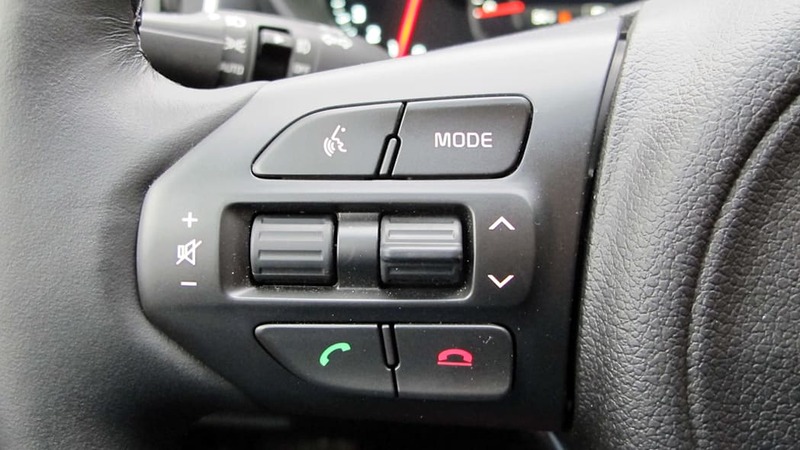 The lock mode should prove handy if you find yourself in deep snow or a ditch, distributing power 50/50 to both front and rear axles for better traction at speeds up to 20 mph. 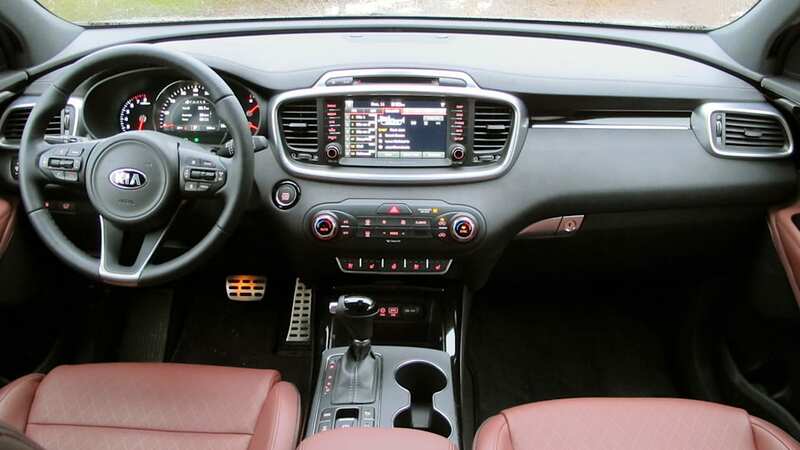 With the Kia Sorento, it's a tale of two interiors, but the takeaway is that there is a nice, harmonious and premium-looking cabin to be had if you select the right trim. We sampled a lower-end V6 model (not pictured), and came away wanting more refinement. 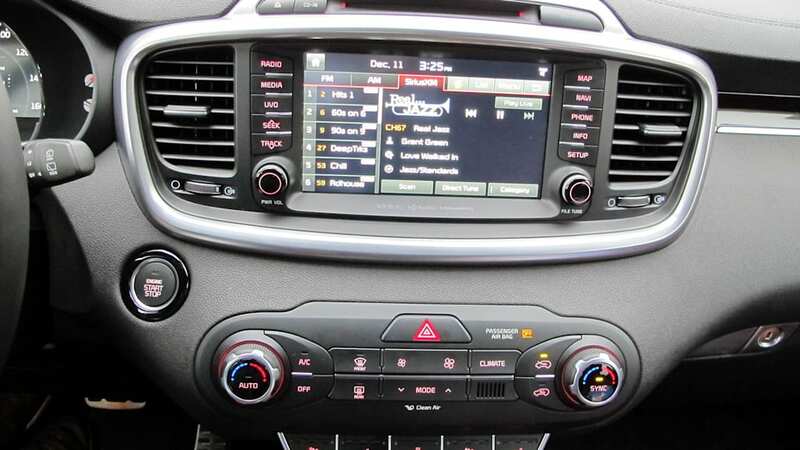 Contrasting colors and hues and a mish-mosh of textures and styles reflect the old Kia design language more than the company's new, more premium direction – especially around the area where the door meets the dash, where the dish on offer is "plastic seven ways." 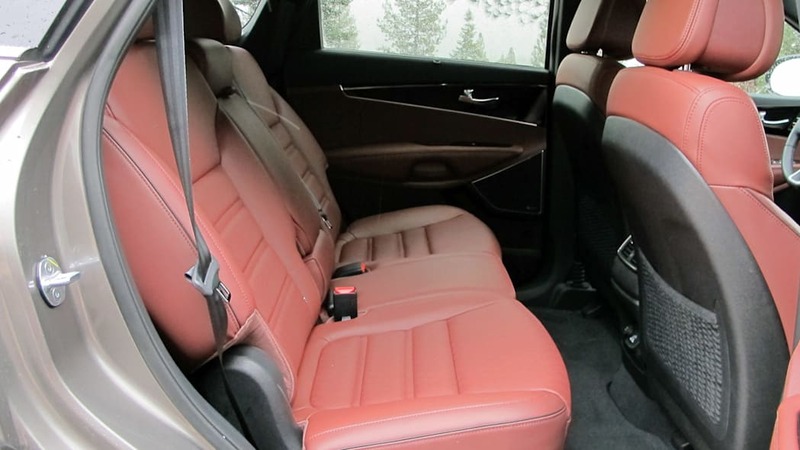 The strangest part was that when we switched out of the V6 and into the 2.0T model seen here with the burgundy Nappa leather interior a few hours later (said to be inspired by a Porsche Cayenne that was casually sitting around Kia's design studio), everything was mysteriously resolved. 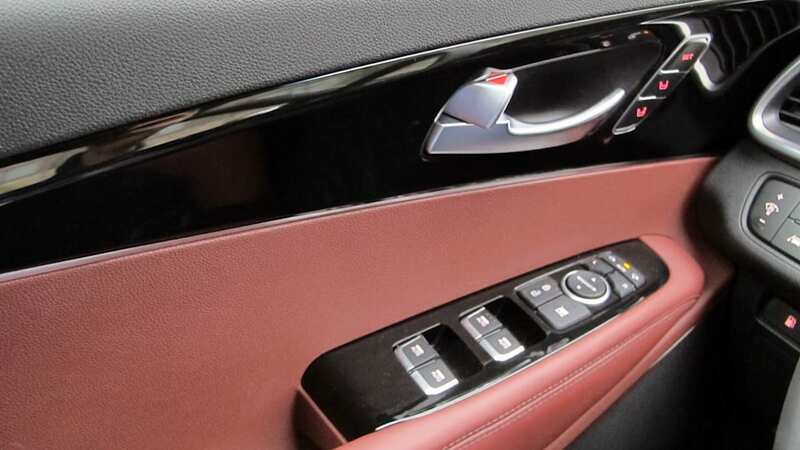 On this trim, the material hues more closely matched, and the cabin appointments appeared more upscale. Of course, some of that is to be expected – it was priced at $45,305, a full $4,500 up the ladder, but the difference was quite profound. Cargo room is abundant at 74 cubic feet overall, but with the third row up, you're limited to 11 cubes. 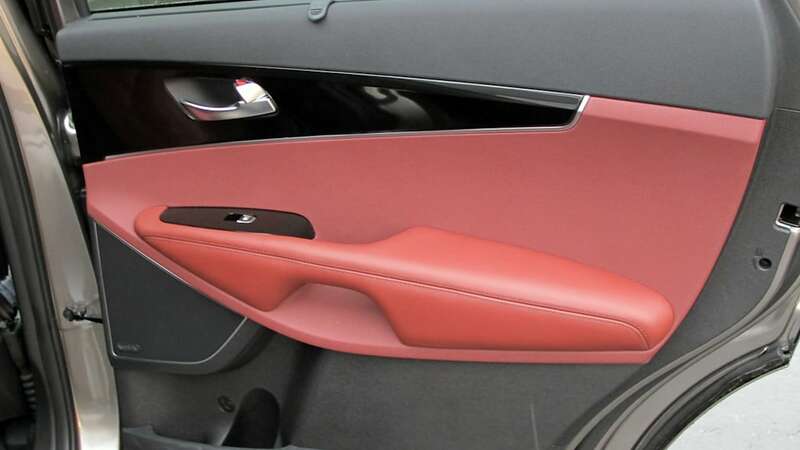 Regardless of which trim you spring for, you'll find plenty of space. Rear-seaters will find good knee- and legroom, and even taller passengers should be content with headroom. 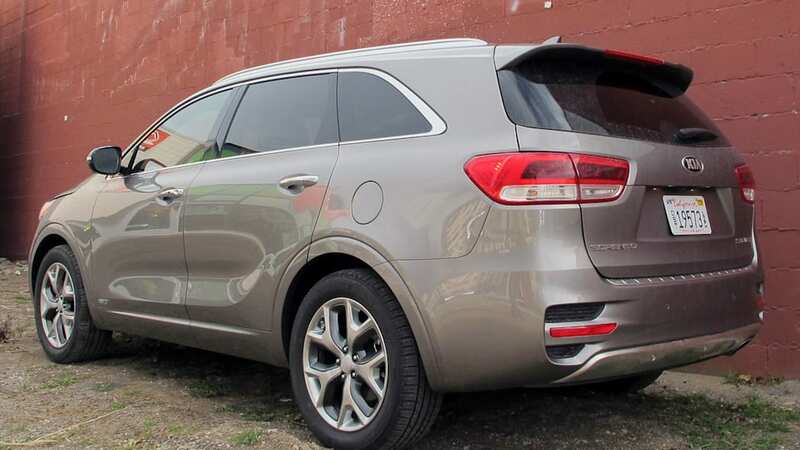 Indeed, while Kia has extended the proportions of this third-gen Sorento – length and wheelbase swell by about 3.0 inches apiece – height has been reduced 0.5-inches. The latter doesn't really translate into reduced cabin space, and the optional panoramic sunroof keeps things airy and open. Cargo room is abundant at 74 cubic feet overall, but with the third row up, you're limited to 11 cubes – an increase from the paltry 9.1 cu-ft previously offered. That's about the same as the trunk on a Mazda MX-5 Miata. The good news for those with a third row, folding the 50/50 split seats is a breeze – a simple pull on the lever quickly folds them flat. They can also be raised and locked into position just as effortlessly. The second row offers a 40/20/40 split, meaning you can easily fit longer objects like a snowboard or skis while still maximizing passenger space. But the pressing question, as we descended our 290-hp, V6-powered Sorento down towards Reno, NV, was... how does it drive? 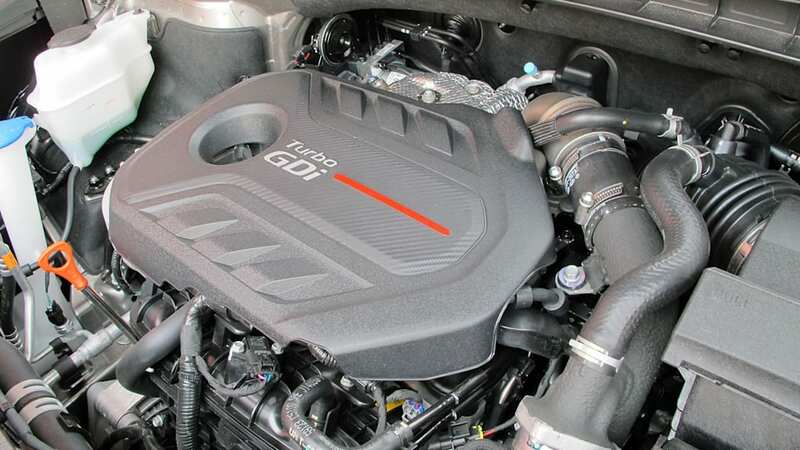 This will be the first time the Sorento is offered with a turbo engine, but Kia expects that just 20 percent of customers will opt for it. Pedal down on the throttle, we quickly observed the engine's power comes on in a smooth, linear fashion. Power is appropriate, although once at highway speed, there is a discernible lag if you mash the gas, meaning it'll take a moment to build passing momentum. And while lag is often associated with turbo engines, the 2.0T, which we got to sample next, was almost entirely absent of the stuff, especially once at speed. 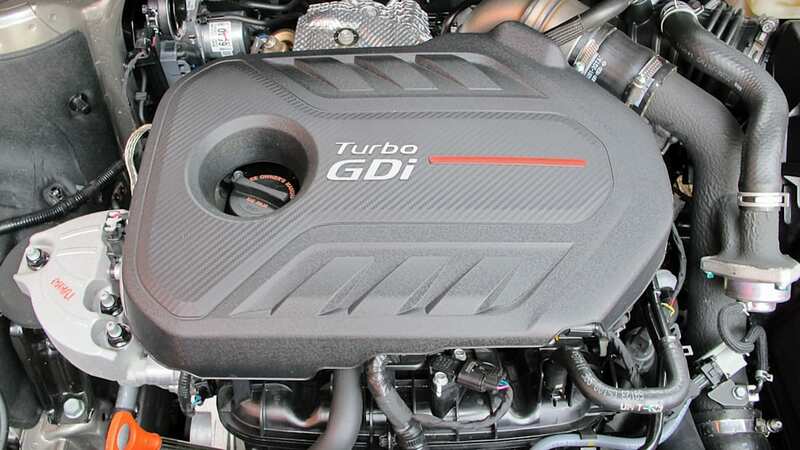 In fact, while the V6 is a good engine, the 2.0-liter turbo felt far sprightlier, and it seemed to have power at the ready whenever called upon. 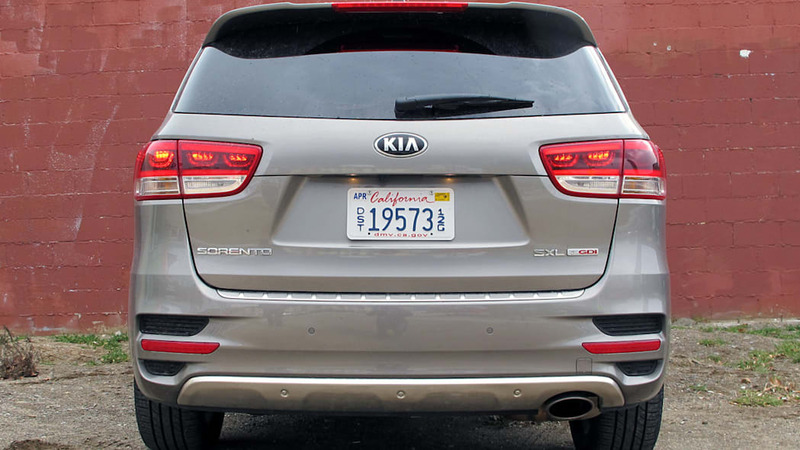 It might be a little slower off the line, but we don't anticipate Sorento owners will be exactly drag racing. And with EPA 2.0T front-wheel fuel economy ratings estimated at 20/27/23 miles per gallon city/highway/combined, you stand to get a couple more mpg, too. While it's true there's a 50-hp difference to contend with, it's not one you'll really feel. 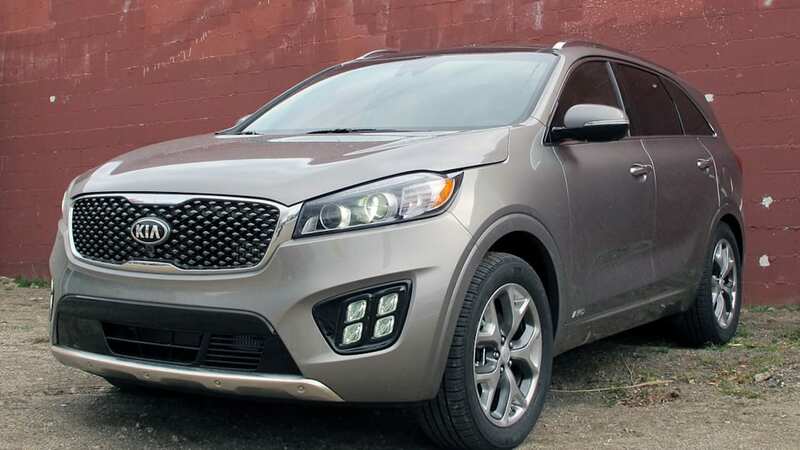 If you need three rows or plan to tow – the 2016 Sorento is capable of towing 5,000 pounds when equipped with AWD – then the V6 is the engine for you. If you don't need the extra seats or have the need for towing, the turbo-four will satisfy. 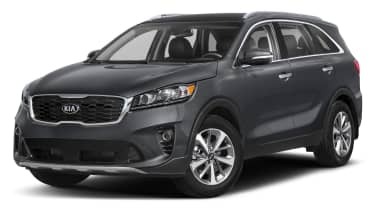 And while this will be the first year the Sorento is offered with a turbo, Kia conservatively expects that just 20 percent of customers will opt for it, while the other 80 percent of buyers will be split right down the middle between the two naturally aspirated engines. Sadly, Kia didn't have the 2.4-liter available for us to test. But back to the drive. How's the carryover six-speed automatic? Not bad, actually. 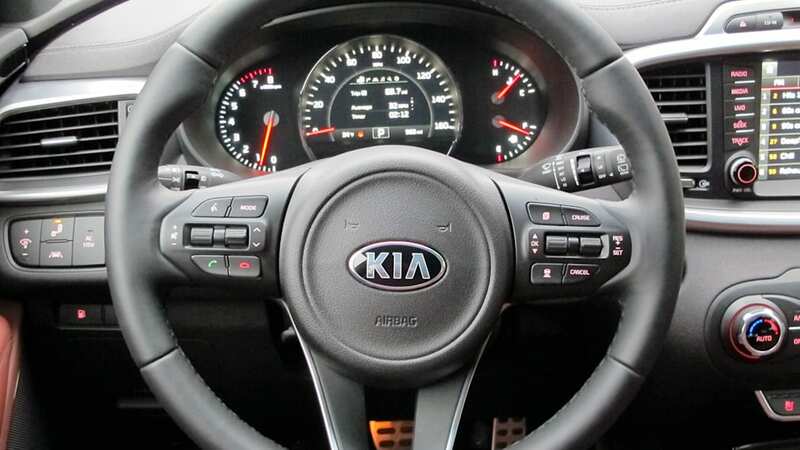 Gearshifts are smooth, and while the next transmission Kia will eventually offer will have more cogs and presumably a little better fuel economy, it's certainly no reason to hold out. 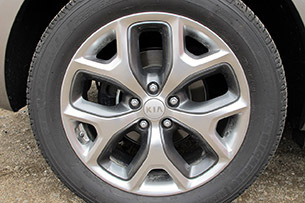 Kia engineers are making no small stink about the great lengths they have gone to in an effort to reduce NVH. 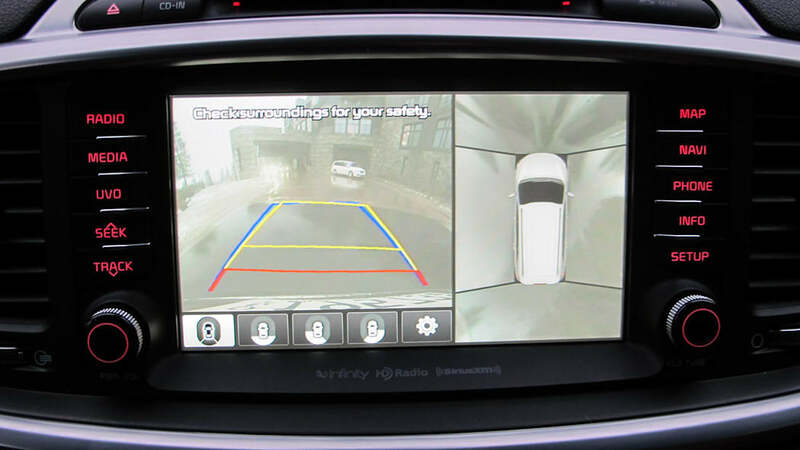 Regardless of which engine is powering your Sorento, you'll appreciate the accurate, linear steering. 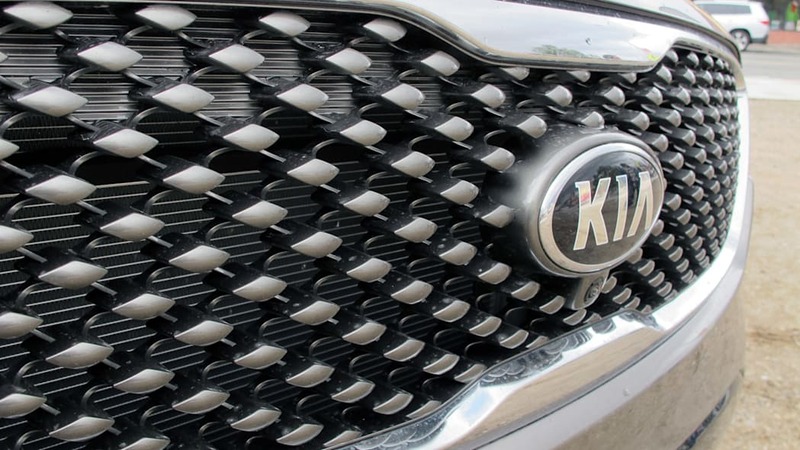 This surprised us not because it was so spectacular, but more so because it represents a dramatic improvement from Kia's steering efforts of just a few years ago. All day, whether it was hurtling into the occasional sharp turn, following the sloping mountain roads, or just making a right-hander in the city, the steering was intuitive, and did what it was supposed to. 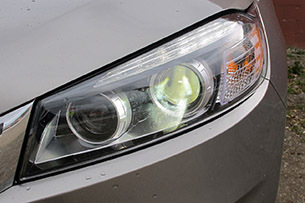 And with slick roads taking the brunt of a massive storm, the confidence-inspiring DynaMax AWD never wavered. Furthermore, despite the poor condition of some of the roads, the suspension and newly revised chassis seemed well prepared to handle road imperfections, making for a smooth, comfortable ride. 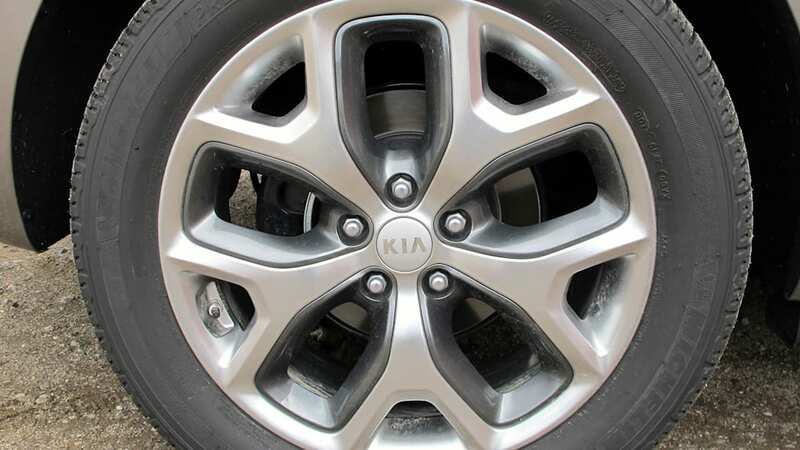 Kia engineers are making no small stink about the great lengths they have gone to in an effort to reduce noise, vibration and harshness (NVH), employing insulating and drag-reducing panels on the underbody. The panels must have been doing their job, because despite massive gusts, rough roads and stormy weather, the cabin was a relatively serene place. And while there's harmony on the inside, on the outside, things have been dialed up a little aesthetically. 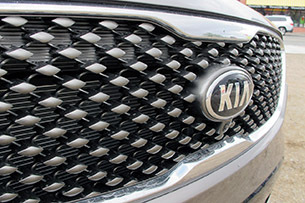 The Sorento's higher, sporty grille makes a bold statement upon first viewing. 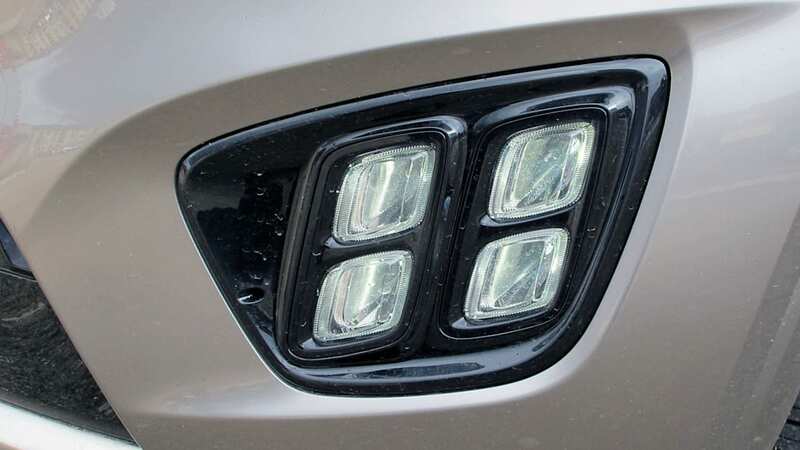 Most striking perhaps, and an option we would seriously consider, are the LED positioning lights, four bulbs housed under each headlight, bearing the trademark "jeweled" look we've seen before from the head of Hyundai and Kia design – and former Audi designer – Peter Schreyer. 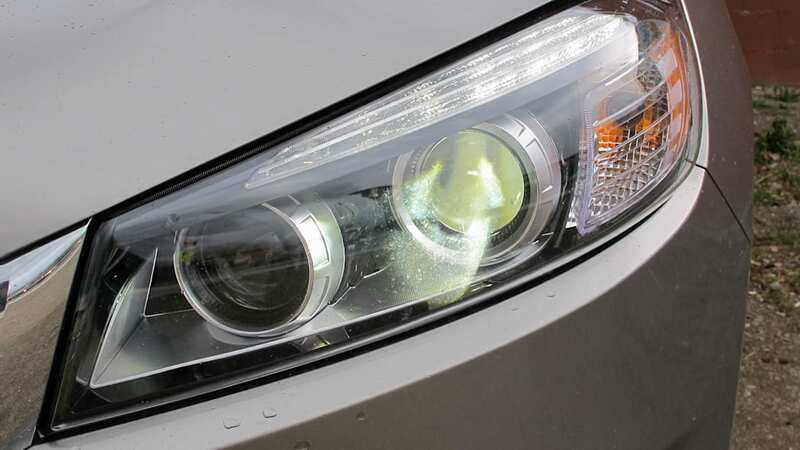 HID headlights are available in the $2,500 Tech Package, which also includes smart cruise control, a lane-departure warning system, surround view monitor, forward-collision mitigation and an electronic parking brake. 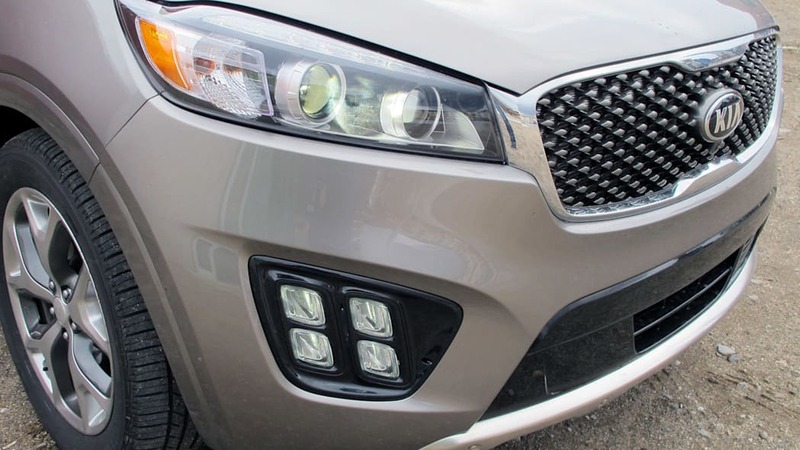 The 2016 Sorento has been comprehensively upgraded, and its charms are more diverse than ever. 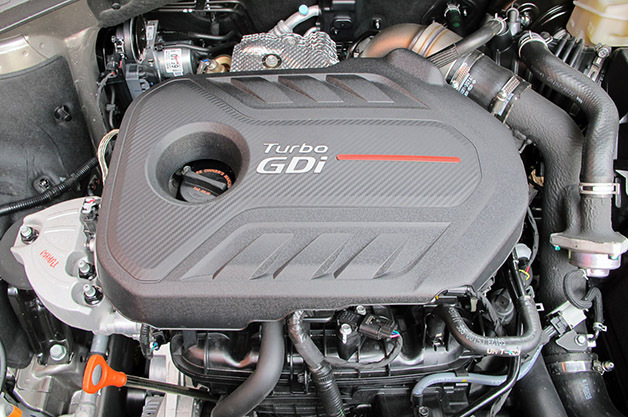 With three engines to choose from, seating for five to seven, a more upscale interior and better driving dynamics, Kia's latest entry into this red-hot class might not be the most dynamically gifted or the most visually distinct model in its class, but it's a seriously well-rounded, well-considered crossover.